Below is the video and transcript from the session Windows 10 Migration and Updates. Adam Smith: Hello. This is Adam Smith, and I want to welcome you to this IT Leadership Summit session on Windows 10 Migration and Updates. We have a great group that will be talking to us today. We'll hear from a customer who has been running Windows 10 in their environment for nearly a year and a half. Then we'll talk to a couple of experts from our channel partner that is working with a number of customers to move them to Windows 10 and help them maintain that environment. To set this up, we recently discovered a survey from the Enterprise Strategy Group or ESG that talked about the benefits people are experiencing from Windows 10. And out of those different answers that the participants gave, we came up with the seven top ones. And you'll notice that several of them, including the very first one, is talking about security. In fact, out of those seven, four of those are talking about security. So, you've got improved patching with file level security, improved identity management. And the others are about the experience, experience from the user, the experience from the employee, and the experience about moving to the operating system. So, with that as a setup, let's go ahead and move on. So the first we want to introduce is Cypress Fairbanks Independent School District. Now, I asked the fellows there, "What does independent school district mean?" Because I was a little unclear. Maybe it's different in Texas. I'm sure it's different in Texas because everything is bigger there. But anyway, independent means funded by the state. So, this is a state-funded school. They are the third largest district in the state of Texas. But to give you a perspective, they're the 23rd largest district in the United States. So it's a very big organization. And they have a lot of devices. They have, if I remember right, 55,000 Windows devices and 31,000 Chrome devices that they manage. So these guys are busy. And we are so thankful that they've join us because this is a busy time for them, trying to get ready to go back to school, and I think the kids are already heading back. So let me introduce our two suspects from Cypress Fairbanks. First is Larry Barrios. And he is the Device Team Manager. And he's worked there 20 years. So, he knows his stuff. And he's seen the evolution of what they've done in education. He likes all things technology and he likes barbecue. So, I asked him if he likes to cook it or eat it, and he said both. And he said he had done 100 briskets one time for a charity event. So, smoked them. Anyway, Austin Chang is a Technical Analyst. He has three years. He's been working on that team for three years, and he is training for an Iron Man Triathlon. So he's been doing some of the smaller triathlons, which I think would kill most of us, but with that, I'm going to go to the next slide and just talk...just set this up for them. And then they can talk through a little bit of this information here. So I asked them, "What was your management's biggest concern heading into this project of migrating to Windows 10? And on the flip side, what was the technical team's biggest concern?" And they both came back with software compatibility. You can imagine with... They rely so much on specialized software in education that that was the number one thing. And so, with that, I'm gonna kinda hand over a little bit of time for them to talk through that. I will, sometimes, interject or maybe Rex can interject with some questions about it. But let's yield the floor to our gentlemen from Cypress Fairbanks. Larry Barrios: Welcome, everyone. When they asked us to talk about our Windows 10 migration and what we based and what we did, we broke it down pretty easy. Started off by saying that, you know, what was common to both the management team and the technical team. Because we are a school district, we supported, at that time, for over 600 software pieces. When we first started, we looked at all those software pieces and we tried to rationalize to see if all those pieces were necessary. So we went through the process of hand testing all those pieces of software to make sure they were, first of all, compatible with Windows 10. We didn't wanna start our Windows 10 migration by introducing software incompatibility. For one thing, that wouldn't allow the students to learn. That was our number one goal. So we hand tested everything. We set up a couple of Windows 10 boxes, and the team went around and installed software. And we whittled it down to barely about 400 pieces of software. Austin Chang: Next thing was we introduced a app-code system so that once we cleaned up the software that was not compatible, the stuff that remained was used by different content areas. So we, the app code system we used to implement into the host name. So the first three digits of our host name would be a specific code identifying a specific content area. For example, you know, 300 would be English, or you know, 302 would be Science. And from there, we were able to deliver software to our users through self-service using Ivanti's Portal Manager, you know, we, based on this app code system, we assigned specific software to those specific content areas. Larry Barrios: Correct. And we see with the portal system, it allowed us to introduce what we call, I guess, the CyFair Store, which means that was where...just like the iTunes store or app stores that are out there currently, the user would go to the CyFair Store, and if they taught English, any English software would be presented to them in that portal. If they taught Science, the same thing. In order for that to work, when we rolled out Windows 10, after testing, one of the other things that we did was we realized that the host name was gonna play a vital role in our organization. One, to identify the machine, where it lived, and try to give us as much information as it could. And the other thing that we used to do is give us the information as far as what content it was in, whether it was an administrative machine, a tutor machine, Science, English. So, we incorporated all that into the naming convention of the machine. And that allowed us to lay down a foundation which we could then utilize for everything else. Adam Smith: I just want to know if that was...that code system was based on the Dewey Decimal System. Larry Barrios: Oh, we actually looked at that. No, seriously. No, we looked at and we started with our app codes. We previously had app codes already and we just beefed those up and made sure that they were current and designed a system around our app codes. Adam Smith: Very good. Okay. So, you used that to be able to target different audiences, whether to push it out to them or to put it on your self-service portal, right? Adam Smith: Awesome. All right. Well, so, let's see. I also talked to you about the provisioning process that you brought up and the fact that you felt that this gave you a lot of latitude and control over what you were doing. So, maybe you can go through, kind of, the things that you did with that, the provisioning. Larry Barrios: I'll start off. This is Larry. I'll start off and then let Austin finish about how he designed the provision that we currently have. In the past, what we did is we had humongous image. And by that I mean everything was incorporated and built inside an image. It has the OS, it has the drivers, and it has everything just layered, that means built into it. So, we had, probably, over 300 images for different content, and everything was baked into that image except for evert image. And then if something was updated, we'd have to go back and update the image, and then ghost it and it just wasn't, it was an ordeal to do. So, looking at this new migration, Austin took, charged it and came up with this design. And I'll let him just talk how he came about it. Austin Chang: Yeah. I think going into Windows 10 and, you know, just moving forward, we wanted to be very flexible. So, what we did as a team was to reconstruct all those images and, you know, just think from the ground up that we're gonna build it by pieces. You know, the base layer would be the operating system. On top of that, you layer drivers for, you know, the 40, 50 different types of devices we have in the district. And then finally, we've layered the applications themselves on top. Instead of having one big, you know, everything baked into one image, if the OS ever changed, I just needed to change the OS and the icon image in another computer right away. Larry Barrios: So the foundation was based on making sure things was modular. So the OS itself was modular. So what we ended up was was we ended up with one Windows 10 image that could be used across all our platforms. And like Austin said, we probably had probably over about 20 different power devices built into the process, the intel, the logic of the machine. Once the OS was layered down, it knows what kind of machine it is at that point and it brings down the right driver for that specific machine. No longer did we have to load all of the drivers hoping that we would get them all. This way, we could use logic to define the hardware type and then assign the right driver package to that machine. And then, we started to layer...we had some common apps that work across the district that everybody uses such as Office or Adobe Reader and flash player and all these other little components that allow the user to become active and start using the machine right away. On top of the app is then layered what we have the project codes, which assign the software to that specific machine. So that project code, at the end, would have all these applications or all the pieces of software in the portal waiting for the user to download when needed. So that gave us a layered approach. It allows us to target the right soft...the right hardware and then also target the right software to the right machines. And gave us the flexibility to be able to change moving forward. So now, if there is a Windows new release, just like there is now, 1803 is out now, it's quite that build, we had to rebuild the OS, and now, when the people image out there, they already have 1803, it's already in place without affecting the drivers or the applications. It's so easy moving forward. Adam Smith: Oh, that's awesome. And that, kind of, leads us to this conversation, that is staying current. And I know that you guys have had some experience with this. You guys, kinda, jumped into it. And you did your migration. I didn't mention this, but you did your migration of roughly 40,000 machines last year, before the school year. And you came in under the time frame that you had allocated for that, which was great. But I don't know how much consideration you'd given to upgrading or updating that was coming out. So, give us a little insight into how you stay current with the Windows 10, and maybe some other things you've run into. Larry Barrios: Oh, we first jumped in, we came in July, machines to get them to Windows 10. We did that knowing we had to move to Windows 10, but we didn't have any directions or clear direction from Microsoft as far as how the patching was gonna work, and at that time, it was called current branch. And so, we still had a lot to explore there and a lot to learn. What that did for us is we went ahead and jumped into Windows 10. But this past summer we realized that when we jumped in that we didn't do...we didn't allow ourselves to be current with the current build of Windows 10. So all, this past summer, we had to touch 9,000 machines. Because those were the ones that were affected, and there was no way we could keep them current as far as the build of Windows 10. So this summer, we had to touch those, and it was faster for us to reimage those. So, we reimaged 9,000 machines all this summer. And then along the way, Austin and team came up with a way to keep all the other machines current and even including those 9,000 moving forward. He'll explain what he did there. Austin Chang: Yeah. So, moving forward, we took a two-pronged approach, you know, for patching and staying current on the Windows updates. First is to, of course, you know, apply the patches to the computers already out there month to month. But furthermore, instead of, you know, reimaging a computer, having to computers reimaged, and then having to patch them again, I would also apply the patch directly to the main image. Remember I was saying how flexible our OS provisioning has become. That allowed me to apply the update directly to the image. And so, every new computer is already 100% patched. Adam Smith: So you basically automated...you've automated that process then, right? So, those patches are applied and, if I'm not mistaken, they're applied monthly, right? Larry Barrios: Right. Whenever there's update in Microsoft, which is monthly, we go ahead and send that out, and the machines stay current. And because of the way our machines are out in the district, they're spread out over 220 square miles, the machines have the agent on them that reports in, and within an 8-hour period, those machines check in and look for updates. And because it's randomized, not all machines are hitting the network at the same time. And the other thing that we have the luxury of doing is because we are an Ivanti customer, the machines out there utilize the peer to peer system of Ivanti. If a machine downloads a patch at a certain subnet at a certain campus, and other machines need that patch, they will talk locally on that subnet, which limits the traffic coming back to us to the server. And the network people are happy about that because it reduces the traffic flow from the campus back to us. We're centrally managed here. So everything's centrally located for the servers. So that cuts down the traffic tremendously, and that creates no overload on the network for them. Adam Smith: Awesome. Now, we say every X number of days here, what were you bringing up with that? That we're suggesting every three days they... I'm curious. Austin Chang: Oh, yeah. Originally, we have it set to scan for new patches every day. Once that, well, every computer will security scan in every day. But we thought, you know, maybe we can...or we're thinking we can probably change it to every, you know, couple of days or every three days. Because, you know, these updates don't come out that often, and if the computer has already done it, it doesn't really need to check again for another few days. Adam Smith: So further minimizing that traffic. Austin Chang: Yes, further minimizing, you know, traffic back to the server. Larry Barrios: And now that we have the system in place, it allows us to go back in and now tweak the different processes that we have. We look at the patching system itself, how can we make this better more efficient. And that was one of the things that we picked up. And so we could now reduce the number of days that it keeps looking for patches now that we're current. So we're still always continuing to tweak the system to try to improve it on our side. Adam Smith: It is a process, right, of learning. So, and speaking of that process of learning, you are in the school, and so you've learned from hard knocks. So tell us what do you think is a little bit unique to your situation because you're in education that other organizations don't necessarily experience or maybe could learn from you. Austin Chang: Because we are a K-12 entity, we deal with a lot of software. We deal with everything from Millie's Math book all the way up to Algebra and even college-level courses in our environment. So the support of software that we have is a wide range. So that in itself is unique. We're not just a healthcare company, we're not just an insurance company, or whatever. We have to be able to handle all those pieces of software on our machines. So that itself, I think, is unique. And then again, timing is very unique in our school district because kids start coming, showing up to our schools at 6:30 in the morning and don't leave till 4:30 and maybe even after hours to a little 6:00, 7:00 o'clock at night. So, our time and our window for patching have to be in the most opportunity way so that the kids are always learning, that we don't stop that in any way. So that presents some issues for us as well and it makes us unique. The number of devices that we support is also...we keep our devices for five years, and like we stated earlier, we support over, probably over 40 different types of hardware at this current time, That's the laptops and desktops. And then the range of people, we support administrative machines, teacher machines, and student machines. So everybody...we have to be able to deliver that content that everybody needs at the right time so that our payroll people get the stuff that they need, that our transportation people get the software that controls their buses and even the maintenance checks on their buses, and then make sure that the HVAC system gets the information that they need to run the HVAC systems for the schools. So yeah, we have a wide range of people that we support as well. Adam Smith: Wonderful. Well, I also asked you what was the most difficult thing, and I think it's the thing that keeps a lot of people up at night and even preventing a lot of people from moving forward within the Windows 10, and that's getting the updating right. So, just any other points about that getting it right. Austin Chang: Like I said earlier, when we first started with Windows 10 we had no direction or a clear view from Microsoft. And I even used the term current branch, and I know that's not even correct anymore. Now, it's the right channel, right? You have to be on the right channel to get support from Microsoft. But we had to stay, we didn't know that we had to keep those channels current to get the support and and get the software to work with those versions of Windows. That's something that we learned after we started rolling things out and then tried to come back and tried to fix on our backend. Adam Smith: So, yeah, it sounds like you guys have done a great job of putting in processes, etc. We had a webinar a couple of months ago and we were talking about how Windows 10 could be so much more expensive to manage if you didn't actually step back and design a process and do things like what you've described of making layers, how to get your applications under control, etc. So there's a couple of questions we've had out from our users or the webinar attendees. One of them wanted to know which tools are you using to do your reimaging. And then one of them wants to know what version of Windows 10 are you running. Austin Chang: Okay. So the first question was what tools were used to reimaging. 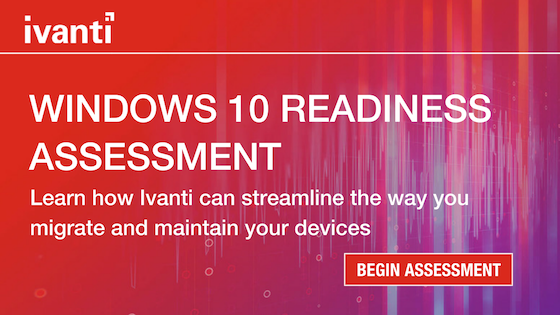 We were using, you know, Ivanti's OS provisioning tool with a few custom pieces. For the drivers, we don't use HII, we use just to apply the drivers and a custom script to detect what device needs a certain driver pack. Since we use all the mobile devices, you know, they have enterprise driver packs already to go. So that's what we use to identify. We're using Windows 10 Education, which was a pretty much enterprise, and we're on version 1709 right now. We're also probably always gonna go with the '09 version, which is the September version, because by the time we need to do a lot of major changes around the summer time, it would have been out for about six months or so. But that's our strategy was to stay on the correct channel that we want. Adam Smith: Now that's a good insight. That's some of that uniqueness about your vertical that makes it interesting for you. I want to jump to your final advice to us, and then any other questions, please, audience, go ahead and submit questions. We'll also have a Q&A towards the end, and these gentlemen will stay on the line and be able to answer those questions towards the end as well. So your final advice for us. Austin Chang: I would say you have to do the testing upfront on your software, make sure it's compatible moving forward. You don't wanna start off your Windows 10 migration with software that you have to tweak and readjust, and just, you know, you're gonna have problems with. That's the best time to do house cleaning on your software and your applications. And then you have to test your software once it's out there, make sure that you can push it to the right users to make sure they can pull it when they need to, make sure that that process is up and running. And then walk through your process. And so just talk about how you're gonna get the updates done. Talk about how you're gonna get the imaging done. Talk about how you're gonna maintain and keep windows current. I think talking about those processes and making sure that you've got that lined up really, really helps. For instance, like, the process of mapping up our updates, that's something that we're tweaking right now still. What we've developed is we're gonna develop a test group of people from our organization, from teachers and administrators and students, and they'll be getting updates and we'll be watching to make sure that machines continue to run, and that the update does not break the machine. And we're concentrating on critical updates. Once the test group says, "Hey, this is great," and we see that they don't have any fallout from those critical updates, then we'll do a global push so that everybody else get those updates. That is something that we decided we needed to have built in because we didn't know if an update was gonna break a machine in any form or fashion. So again, mapping out your updates and then working through your processes, I think, is very, very important. Adam Smith: You know, every time I talk to you guys, I get smarter, but that's because you're in education, right? So, I really appreciate all of this information you've shared with us. And if anybody's out there, we also have a case study that talks about what Cypress Fairbanks has done using our software, but obviously, they have their own systems, they have their own processes, and you have to develop those. You can't just rely on one particular tool or technology or process to do it. You have to develop for yourself. So, it was great to hear from a customer perspective, from Cypress Fairbanks. Let's now shift gears and move to another perspective, from some experts, from a channel partner RennerBrown. I've got Mike Meltz and Kevin Burns, and they're going to take us through a little bit of information about how to get going with Windows 10, what are some of the things that you need to look at when you're planning for Windows 10, and how to execute that. So I'm gonna turn a little time over to them to introduce themselves. Maybe I can ask them a couple of questions along the way. So, Mike, go ahead. Take it away. Mike Meltz: Thanks a lot. We are happy to be here today. Again, my name is Mike Meltz. I'm the Director of Professional Services for RennerBrown. I've spent a lot of time using Windows 10 along the way as a customer and as a consultant. We're really excited to be here today to talk about some of the challenges that we've seen working with our other customers. And we hope the discussion today will really help you on your journey to Windows 10. Adam Smith: Very good, Mike. So you've got an interesting background too. Tell us why you're connected to Ivanti. Mike Meltz: Yes. So, I actually was a former Ivanti customer. I was the Director of Infrastructure and security, and used the Ivanti toolsets at my organization. And we did a lot of things and a lot of migrations, a lot of patch management and security. Enjoyed doing that for a while, then I actually went over to Ivanti as a security sales person and specialized in a lot of the security products, things like our patching and our EPM product for [inaudible 00:26:43]. And then after a little stint there, I moved over to RennerBrown to non professional services. So I've had a fun storied career working with Ivanti for many years. Adam Smith: Oh, that sounds good. All right, Kevin Burns, we have you on the phone too, and you're kind of our technical colored guy, right? Kevin Burns: Absolutely. So, yep, I'm a Senior Solutions Architect. I've been with RennerBrown for about six years now. And I've spend a lot of time with our customers, and we've a very varied customer-base so we get to see a lot of different scenarios and a lot of different challenges that sometimes take some creative solutions. And mainly, what my role is is helping customers align their needs with the solutions and processes that we can provide. And I tend to be hands on, very hands on with our larger customers. Adam Smith: That sounds great. So what do you do with your time off, when you're not helping customers? Kevin Burns: I am mainly trying stuff around the house and playing more hockey when I find a few free minutes. Adam Smith: Nah, I used to play hockey when I was a kid. I love that sport. All right. Well, let's dive into this conversation a little bit. We're gonna just ask you a couple of questions. So a few questions and then you guys go ahead and jump in and give us a few answers to help prepare us for Windows 10 and what we can do to do it better. So first of all, let me ask you the question, as a company gets started on that journey towards Windows 10, where should they really start? Kevin Burns: So, I'll start off with that one. Getting an understanding of your environment is probably the most important part of the process in the beginning here. So you need to have a good understanding of what you have out there in terms of hardware and what will and won't support Windows 10. You also, now, need to start having a visual as to what your supply chain looks like for the new hardware coming in because we're finding that more and more equipment is not supporting Windows 7. So you may be forced to be prepared for [inaudible 00:28:43] earlier than you had originally expected. On the software side, same thing. You've got to understand what is gonna be compatible, what isn't going to be compatible. You may be making decisions about how you're gonna handle Office, for instance. Is this the time we wanna move to 365 or not? And then you also need to understand if there are machines in your environment where 10 is just not gonna be a place for. So if you need to consider, for instance, the long-term servicing channel. Licensing is important, that may affect, you know, migration paths that you have a value to you. And it may also affect, again, on the software side, what software is gonna be available to you and changes you may need make there. Adam Smith: Wonderful. All right, so, as you get started, many people think about the technical things that you need to do to get ready for Windows 10 or to tackle when you're moving to Windows 10. But what are some of the non technical things that your company should do or be thinking about as they plan their Windows 10 migration? Mike Meltz: Sure. So, a Good thing about Microsoft, kind of, forcing 10 on people the past couple of years means that your users are probably a lot more familiar with it than we'd like to get them credit for. And a lot of them are probably wondering why they're not on Windows 10 today. But it doesn't mean everybody is. So, you do need to make sure that any soft documentation you have, any business processes that you have are reviewed and aligned with how things work in 10. You can start taking advantage of this when you roll it out by targeting your primary people first with this that have a good understanding of what those processes are to help you find those road gaps. Adam Smith: Very good. So part of that non technical thing would probably be some of the communications or your communications plans that you have to talk to your end users and maybe some of the training that's involved. Can you describe some of that, you guys? Mike Meltz: Sure. So, a migration is gonna be a little disruptive to people. So you sort of have to sell it to them to some degree. You know, even the best plan and the smoothest migration does mean that things change for your users, and they have a job that they wanna do and anything that kind of rocks the boat a little bit with that could, you know, be viewed negatively towards you. So, prepare users well in advance, setting your reasons as to why you're going to move to Windows 10, and also highlighting some of the advantages that you can now take advantage of once you move to Windows 10 are a great way to position or prepare your users for them, and maybe get them a little bit excited. And the more engaged people are with that, the better and the smoother the early part of that process will go when you're beginning your piloting and you're testing in you're early adapters. Kevin Burns: Let me jump in there, is that really understanding that Windows 10 is not just an IT project, it's really a business project, and having your company understand what's going on, a lot of players involved, make sure you have stakeholders, it will really make the project more successful. Sometimes, the customers will just jump in, the IT team will start testing Windows 10, and the company's really not ready. So having the business engaged and everybody on the same page, I think, will be extremely helpful. Adam Smith: Yeah, that makes a lot of sense. So let's say we move on to the technical planning sessions. When you're involved in that, what are some of the things that you need to test or would come up in some of those planning sessions? Mike Meltz: Sure. So, probably, the most important aspect of this migration is your application set. Now, this isn't like it was when it was XP to 7, and we had a much greater challenge with compatibility between versions. 7 to 10 does fare a lot better. So you'll find that a lot of your applications that exist today, you know, are perfectly compatible with 10. There's some great tools out there to help you identify that. The Microsoft Upgrade Analytics component is very helpful in that if you're running something like endpoint manager, and you have a good software library already defined within there, that can help you track down what may be problem points. But it's also a time to kind of review what you're using and how you're using it. So, this may be a time where you're thinking about changing what your standard browser is, right? Maybe want people using Chrome or maybe you wanna take advantage of that. Or maybe you have needs to remain on a legacy IA. All these are decisions that are gonna impact your build, and they're going to impact any of your planning, your communication, and your training. So, you do need to review very deeply what you have in your environment, what your applications look like, and then how you're gonna manage those machines. This is a great time to take advantage of things like group policy, things like environment manager, and start defining standard processes and standard policies across your environment. 10, even at the enterprise level, it requires a good deal of customization from those people out of the box, and you really don't want to be doing that just through registry hacks and, you know, scripts that someone threw together. You want take advantage of tools meant to do that in a good and coordinated managed fashion. Adam Smith: Very good. So, these IT teams have a lot of decisions to make, and when they're planning their roll out. Can you talk about some of the pros and cons of some of the ways that you can migrate such as in place versus doing a clean install or some others that are out there? Kevin Burns: Sure. So, generally, we find that most environments is a mix of how you're gonna go about deploying this. You know, you may have old hardware that needs to be replaced so you're gonna have some type of full migration, almost always in your environment. You usually choose to do in-places because you have equipment that simply can't support it. So you've got to be prepared to approach this from multiple ways. The in-place upgrade, it's got some great advantages to it. It's less of a concern of losing user data. It's less of a concern of potentially run-off apps that you have settings for or that you have saved data for that you may not catch in a migration script. But it's got its downfalls too. You're gonna bring along some of the baggage from that machine potentially. You're not gonna get a true standardization in your environment. And it's not going to be able to migrate everything. And, you know, we find that it won't even migrate some applications consistently. 90% of the time, one particular app will come over just fine, 10% it won't and you still need to revisit that machine and retouch that application. So again, going back to that planning and having a great understanding of your environment is gonna help you choose what's gonna work best for you. If you're doing a complete rebuild of your environment, so we're doing an actual migration of the data, off capture of applications, and redeploy those applications, we gotta make sure we've got the tools that are gonna help us do that. Again, a great, can build endpoint manager to be able to do that. Another big advantage that we see that a lot of people like to do that rebuild for is it's a great time to move UC for your bios if you're not already doing that today. A lot of people that are running their Windows 7, you know, images, you had a legacy fashion for years and they'd never really made that jump, not that you can't convert that, you know, on an in-place upgrade scenario, but it's certainly much easier and much more reliable to do that on a clean build. So, having that direction's really...or having that understanding of what your environment is and what you want it to look like at the end of the project is really gonna help you define which path you take on here. But as I said, most places it's a combination of all three. Adam Smith: Hmm. So you've mentioned some things about the user experience there and how to handle certain things, and certain things wouldn't be migrated over necessarily in an in-place migration. And that in-place migration's kind of a one-off type thing. It's a one-to-one thing where if you wanted to upgrade a bunch of different devices, you'd probably wanna install your own image, right? Kevin Burns: Potentially, yes. So you know, you can do a standard push of an in-place upgrade where you're gonna basically kick each machine off individually. It's gonna run through the wizard and it's gonna upgrade them. But as I said, your results are not gonna necessarily be as consistent as though you were, if you were doing a wipe and replace if you would. Kevin Burns: So, you know, maybe if you were to use two identical machines, very well could act a little differently when you do an in-place upgrade on them. Adam Smith: All right. So, how about the user data and the personal settings. How do you handle those type of things if you're moving them over? Mike Meltz: So, there's a lot of great tools available for that. So, you know, again, something like Environment Manager is excellent at capturing the user's experience. So you can now move that to new devices and even use that moving forward. For the Microsoft tools, we've got USMT, which again, is great, but we do need to understand that these tools are only as good as we configure them to use. So USMT, we go back to the whole how do I get just what I want off and not leave something behind. And this, again, ties all the way back to our user communications. We do need our users to work with us on this. We need to make sure that they've got data in standard places, so we know that we can capture it from there, and we don't have to capture the whole bunch of garbage. We need a backup strategy and a, essentially, a roll back plan in place for if we do miss something. So, utilizing the tools that you have in your environment and getting a good hand on your environment in advance so you can be targeted in how you capture that information is going to make it all that much more successful. At the same time, you know, it's helpful in your communication plans to ensure that your users understand us, that if they're not, you know, playing by the rules, there's a good chance that they're gonna miss something. So, it gives you a good chance to take a step back and say, Well, what is our data policy in here, in our environment?" The other thing that's important is as you're migrating all this data, you need to have a plan for the retention of that, you need to have a plan for the security of that, because we don't wanna open up giant security holds [SP] in our environment, if we suddenly copy or there's a profile up to, you know, some share out of the server, that's not being controlled. So, selecting the right approach for that, again, is gonna be dependent on your environment and what you have available to you, but there's a wide selection of tools out there that can make your job much easier for that. Adam Smith: That's awesome. Well, you've talked about rolling it out and getting people migrated. Are there challenges you're seeing with people keeping the environment up to date or, you know, moving towards Windows as a service? Mike Meltz: Well, that's the thing, right? We have to start thinking of Windows as a service and we're not gonna deploy our, you know, Windows 10 image, pat ourselves on the back, and not have to worry about this for three years or five years or whatever. We have feature updates that come out regularly. We need to have a strategy in place for how we're going to test those, because those are just security patches. They can automatically affect the way that your machines function. So we need to have a plan in place for how we're gonna test those, how we're going to move them out, how we're gonna keep our builds updated. So I'm not bringing my new image online and all of the sudden spending the next three hours taking patches. Additionally, you need to factor in how you've left your applications play for that. You know, usually, feature updates is almost going to be, to some extent, like a mini migration. You may need to move up the next, you know, 1809, 1810, whatever it ends up being. You may need to update your AV product to support that. So you need to have a good understanding, and your staff has to have a good understanding, of how Windows works as you consider as it a service, and what your target points are going to be for those feature updates. Do you plan on trying to take each one? Do you say, "I'm gonna skip every other one?" And that's gonna help select what build revision you're on as you move forward in this process. Adam Smith: ...many times, it's almost like another build, but you have to be having processes in place to be able to handle it, right? Kevin Burns: Absolutely, and that's what's really key about, you know, when you are starting to build your image or, you know, whatever, half [inaudible 00:41:34] to clean this thing out. Being modular about it is going to help you as you move forward in that service. You know, this is being the day of "Hey, I just have a ghost reference signature and I do own that, and maybe even a script to do on it are done. You know, having something where you can step through that build process and then adapt that build process without having to reinvent the wheel every single time a feature update comes back is gonna save you a ton of time in the long run. Adam Smith: Yeah, that's so true. Well, let's see. Can you give... I know we haven't talked about this before, but can you give some examples of challenges that people are faced in migrating to or maintaining Windows 10? What do you see? Because you're helping multiple customers out there. What challenges can they expect to face? Kevin Burns: So, the biggest challenge that we find is people being a little bit unprepared for it. You know, like I said, it's starting to become rare...or not rare, but it's starting to become less likely that you're going to find new good hardware that supports Windows tech or I'll shop for new laptops and desktops. And organizations were, you know, saying, "Well, we'll get the 2019," and now all of the sudden, they realize they can't order a new laptop for new hires. Or that there is a three-month wait for... And what ends up happening is these things start finding their way out into the wild, in an unprepared fashion. And they have to be revisited, they have to be rolled back in. As they start working on their Windows 10 processes ,they realize that it just doesn't even work with what they've already put out there, and they need to revisit it then. The other item that we're seeing a lot of challenges with is on the software side. So, if you're doing a rebuild, for instance, making sure you've got everything packaged, making sure that you've got a way of the [inaudible 00:43:25] and transferring those applications from machine A to machine B is something that a lot of organizations area little bit unprepared for. You know, we have an application that hasn't been packaged, you know, it's not used a lot in our environment, so we never felt the need to package it, but it turns out they got 30 or 40 machines that are actually running that because it's just over the years that's what's been installed. And now, it's a big problem if you're gonna do a wipe and replace on those machines. And even if you're not gonna do a wipe and replace on those machines, you need to prepare in case that thing fails an in-place upgrade. So, it's kind of opening a lot of eyes. You know, people are starting off on this without really thinking it through all the way. And the planning is key. Being able to come into it prepared, with a good understanding, which sometimes is challenging because Microsoft likes to change things on us every few months. But with a good understanding of the direction you want to take is really what's gonna help you out on this path. Adam Smith: That's great. That's great. You gotta have a plan, right? And if you don't have a plan, you get surprised. And then you're working with your hair on fire, and that's never a good thing. So, very good. Any final thoughts that you guys have on, you know, what customers can expect or things that they need to plan for or what have you? Kevin Burns: I think the biggest thing I take away from , you know, the projects that we do is people are happy with the end result of this, you know, once they get through the initial pain. There's a lot of great reasons to be on Windows 10. In the process of getting to Windows 10, you're going to learn a lot about your environment that you may or may not know, and you're gonna develop and define things that are already continue to help you moving forward. So, as Mike said at the beginning here, it's not so much... Well, it's obviously technical, a technical project, but it's more of a business project at that same time where you're kinda changing the way you do IT. And it's a great chance to take advantage of a project like this to help, you know, further define your roles and your business processes as they relate to IT wariness. Adam Smith: That's awesome. Awesome advice from you guys. You guys are great. Many of our best customer success stories come from you guys. We just love working with you. So Mike and Kevin, it's great to have you on this webinar, and we really appreciate what you do for us and for our customers. Thanks again to everyone for joining us. If you're interested in following information about Windows 10, please join us for a bimonthly webinar called "Windows 10, Insights for the Enterprise." Thanks again and hope to hear from you soon. And make it a great day.